A beef I might not normally share but since I have the luxury of a platform (this blog) and an entire large container of Costco peppermint bark next to me, why not? Grab a cuppa’ and join me. How did I miss the memo on Christmas being a box to check off? Something to “accomplish” rather than enjoy and celebrate? A competition with friends and neighbors over who had the most “Christmasy” Christmas? My friends obviously got the memo because over the weekend I’ve seen half a dozen “I’m so exhausted and it’s only the first week of December” Facebook posts. Several variations on that theme appeared. One felt hanging outdoor and indoor lights should be enough. She was dreading the baking , decorating and present buying that lay ahead. Another baked several hundred holiday treats so her kids could have the “perfect” gingerbread snowmen to give to family and friends. She posted the pics of the finished product at 3 a.m. Her next post was (surprise, surprise) that she was sick in bed with a bug she’d gotten because she was run down. A third complained about buying for her husband’s relatives, who live hundreds of miles away and generally come to her house once per year to be cooked for, kept in good liquor and showered with presents—all while loudly proclaiming their political beliefs (not hers) and advising her on how to better raise her children. Today, at Costco (buying aforementioned tub of peppermint bark which is delightful, I must say, but disappearing at an alarming rate) I conducted a little experiment. I was just there to buy Christmas ribbon and was not in a feverish shopping frenzy. So, I smiled at each person I walked by. I said “hello” to many. Not one looked calm. Not one was smiling. They all looked surprised at my pleasantry and then reciprocated (Well, most. 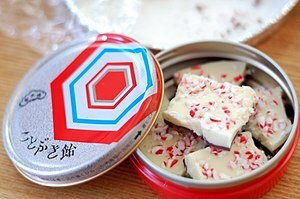 For the others, I highly recommend some peppermint bark. A holiday shot in the arm. It truly is.). Most looked tired, grumpy or desperate. Plenty of couples arguing over what appetizers will work for the holiday party. A father and children complaining because there were cakes with ornaments on them, but not candy canes. And a poor, misguided man who was buying a blender for his wife for Christmas. Now if that’s not heading down the road to divorce, I don’t know what is. NEVER buy her anything with a plug. It should sparkle or smell good, gentlemen. All else fails. When did Christmas become a production? One in which we’re competing with every other family for the Normal Rockwell calendar cover? Do what you need to do. Get a Charlie Brown tree instead of the 10-footer. Tell your family you’re done with the copious gifting and just want to spend time together celebrating. Take a trip to a mountain cabin, far away from the hustle and bustle, and bring a few strands of battery-operated lights to decorate the trees. Bring on the Johnny Mathis Christmas tunes and some good hot chocolate. Truth is, I don’t know what will make it feel like Christmas for you. But I’d encourage you to find it. It’s not a box, to be checked off. It’s not something to accomplish. It’s the celebration of a sacred moment in our world and we don’t have very many of those, to be frank. So don’t ruin it. Stop mucking it up. And for God’s sake, TJ Maxx, give your ad team some peppermint bark and tell them to be less crass next year. I don’t “accomplish” Christmas. I celebrate it. I love this! I looked around my house yesterday and thought “I should change out that strand of lights that burned out, I should fix that star on the top of the tree cause it’s crooked, that table top is not decorated enough, I should finish the other two boxes of decorations, etc. etc.” Instead, I made enchiladas and we had a family dinner! Here’s hoping I can continue to do the right things the rest of the season! Love this! And I bet your family is happier because you are happier and more relaxed. Good thoughts. I have had the same feeling about the TJMaxx ad. I was in bed with the flu last week and had more than one moment feeling that I had soooo much to do. I have since realized that it will all get done and one more batch of cookies or a high end gift won’t make one bit of difference when the family gets together. Merry Christmas to all! God bless us – everyone of us ! D*mnit, you did it again! I thought I did not have time to read your post because I am “so busy”. But, I read it and, you are right. Thank you again for making me stop the madness and reconsider my outlook. I had, by definition, a sh*tty week and was lamenting my problems then you made me realize I need to slow down and celebrate not accomplish. I am going to get a glass of red wine and some salted caramels from Trader Joe’s and “celebrate” a Philadelphia Eagles win and a wonderful Christmas season! I hope you had the mellowest of afternoons/evenings, Erin:). And didn’t frantically wrap, buy or bake anything. Thank you very much for the reblog! I appreciate it:). You’re welcome. Lots of my friends also agreed with you, and it’s a timely reminder to people to calm down and enjoy the season, rather than becoming too precious about it. This is a brilliant post, Kay, that I hope many people take note of. In Australia, there have been Christmas goods in the shop since September! In my family, however, we do not speak or think of Christmas until after my mother’s birthday on December 7. That was on Saturday, and we went to the movies at a major shopping centre. It was chaos. Where there is usually plenty of parking for thousands of cars, there was not a space. People waited at the end of each row like vultures, for someone else to leave. People were even parking in bus zones or on the grass. Inside, the centre was mayhem, though, luckily for us, hardly anyone was in the restaurant we wanted to go to or at the cinema. That’s because everyone was SHOPPING madly. I asked my family that day, Why is it that the public has been so taken in by the commercialisation of Christmas? It is, after all, just one day, yet it seems to consume people for months. And you’re right, most of them don’t look happy. In my family, we have a low-key Christmas. It’s either at my mother’s place or at mine, and we cook a roast turkey with some nice salads and dessert. The table is set beautifully and there are presents for everyone, but nothing over the top. Christmas takes me a few hours to shop for and a few hours to prepare. That’s it. And when it’s over, it’s over for 12 months. Well said! When it’s over, it’s over for 12 months. We lose that perspective, somehow, in all the mania.